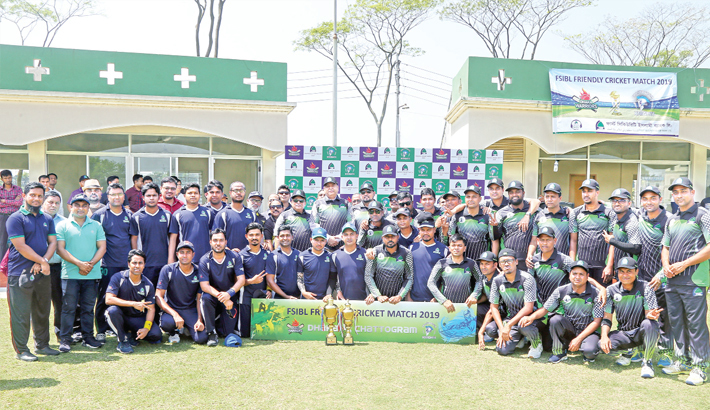 A friendly cricket match between Dhaka and Chattogram Zone of First Security Islami Bank Ltd was held at BKSP in Savar on Saturday. Chattogram Knights defeated Dhaka Warriors by 8 wickets. Md Jahangir Alam of Chattogram Knights was declared man of the match for his unbeaten 45 runs while Shabibul Azam scored the highest 47 runs for the team. First Security Islami Bank Managing Director Sayed Waseque Md Ali was present as chief guest in the friendly match. Additional Managing Director Abdul Aziz, Deputy Managing Director Md Mustafa Khair, Chattogram Zonal Head Md Hafizur Rahman, Head of General Services Division of Head Office SM Nazrul Islam and other officials were also present on the occasion.